The image below depicts the pictures of a woman before and after rhytidectomy. Before and after biplanar face lift with lower eyelid blepharoplasty and chin augmentation. The ideal rhytidectomy candidate is a middle-aged woman with a fair or medium complexion and a minimal amount of adipose tissue and moderate skin laxity in the jowl and cervicomental regions. An individual with a strong, attractive underlying osseous framework, including prominent zygomatic arches, obtains even further enhancement. Conversely, an individual who is overweight with hyperpigmented thick skin does not obtain optimal results. Individuals with ptotic submandibular glands and an inferiorly positioned hyoid have a more obtuse cervicomental angle and obtain less-than-optimal results. For further reading, please see Medscape's resource center on aesthetic medicine. Aging is characterized by tissue atrophy and reduction in skin's cellular and protein components. Gravitational redistribution of soft tissues occurs. Sun exposure contributes to the clinical changes observed in the aging face. Histologically, the skin epidermis thins with retraction of the rete pegs. Decreasing numbers of melanocytes create areas of uneven pigmentary changes. In the dermis, elastic filaments become thin and fragmented, increasing skin laxity. Dermal collagen becomes more biochemically stable, but it is reduced in quantity. Vascular supply is also reduced, resulting in a pale appearance. Subcutaneous tissues undergo fat atrophy with gravitational redistribution of soft tissues. With skin laxity, whole regions of the facial skin begin to sag and loosen. Habitual facial expressions can lead to progressive recontouring of the subcutaneous layer, and, hence, coarse wrinkles and deep folds develop. Age-related changes in bone density also affect the facial skeleton. Loss of bone mass in the mandible, maxilla, and frontal bones induce increased sagging of the forehead and facial skin. This process contributes to the perception of a sagging neckline and the occurrence of jowling along the mandible with a loss of a clear delineation between the jaw line and the neck. Sun exposure contributes to the clinical changes observed in the aging face. Sun-damaged epidermis is characterized by a reduction in structural elements that leads to skin wrinkling. Elastic fibers grow thickened and disorganized, a process called elastosis, and dermal collagen becomes degenerated. The overall improvement possible with rhytidectomy is limited by aging of the upper third of the face and eyelids and the presence of wrinkles. When these problems are not addressed, suboptimal results are obtained, leaving half the face appearing aged. The underlying structure of the face is also critical because the redraping of the skin from the facelift highlights attractive cheekbones, chin, and jaw line. A relatively high and posterior hyoid is ideal, allowing maximal elevation of the submental contour. Patients with rounder faces, low cheekbones, short mandibles, and ptotic submandibular glands have limited cervicofacial definition with rhytidectomy alone. With these patients, adjunctive cheek and chin implantation may be necessary to provide the desired result. Patients with a small chin or inferiorly placed hyoid cannot achieve the desired cervicomental definition without a chin implant. The authors use a 2-layer cervicofacial rhytidectomy with suspension of the superficial musculoaponeurotic system (SMAS). The SMAS fascia is a fanlike fascia that envelops the face and is used to resuspend sagging facial tissues. The SMAS is continuous with the platysma muscle inferiorly and the superficial temporal fascia superiorly, and it is superficial to the parotid fascia. The SMAS connects to the fascial musculature in the nasolabial, perioral, and periorbital regions. Facial nerve branches that exit the parotid gland are deep to the SMAS. The frontal branch of the facial nerve is deep to the superficial temporal fascia. Therefore, to avoid injury, the plane of dissection should not be as deep as the temporal fascia. Age alone should not be used as a criterion to deny a patient surgery because patients in the eighth and ninth decades of life can enjoy up to another 15 years of life. Absolute contraindications include bleeding diatheses and American Society of Anesthesiologists (ASA) classes IV and V. Strong relative contraindications include patients with diseases predisposing to poor wound healing, ie, those with diabetes mellitus, those on long-term steroid therapy, or those with connective-tissue disorders such as Ehlers-Danlos syndrome. A history of smoking is relevant to preoperative assessment. Rees and Aston noted that people who smoke have 12 times more risk of skin slough than people who do not smoke do. Patients who smoke also have a higher risk of hematoma formation. These effects are believed to be due to increased vasoconstriction and coughing in smokers, respectively. If the patient stops smoking for 1 month before and after surgery, these complications can be limited. Psychological assessment is as important as the patient's medical status. The surgeon must determine patient motivation and must ascertain whether the patient has reasonable expectations for the surgical outcome. Any psychiatric illness that involves a distorted perception of reality, such as schizophrenia, should be a contraindication to surgery. If any question exists as to whether a patient has a psychiatric illness that may impact the surgical plan, a psychiatric consult is required. 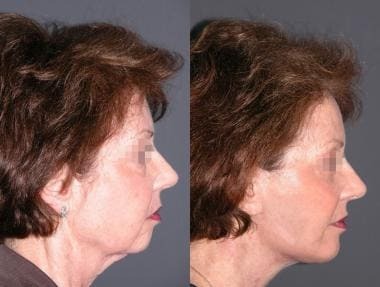 Ilankovan V. Recent Advances in Face Lift to Achieve Facial Balance. J Maxillofac Oral Surg. 2017 Mar. 16 (1):3-12. [Medline]. [Full Text]. D'Arpa S, Cordova A, Pirrello R, Zabbia G, Kalbermatten D, Moschella F. The face lift SMAS plication flap for reconstruction of large temporofrontal defects: reconstructive surgery meets cosmetic surgery. Plast Reconstr Surg. 2011 May. 127(5):2068-75. [Medline]. Castello MF, Lazzeri D, Silvestri A, Agostini T, Gigliotti D, Marcelli C, et al. Modified superficial musculoaponeurotic system face-lift: a review of 327 consecutive procedures and a patient satisfaction assessment. Aesthetic Plast Surg. 2011 Apr. 35(2):147-55. [Medline]. Beale EW, Rasko Y, Rohrich RJ. A 20-year experience with secondary rhytidectomy: a review of technique, longevity, and outcomes. Plast Reconstr Surg. 2013 Mar. 131(3):625-34. [Medline]. ASPS National Clearinghouse of Plastic Surgery Procedural Statistics. 2014 Plastic Surgery Statistics Report. American Society of Plastic Surgeons. Available at http://www.plasticsurgery.org/Documents/news-resources/statistics/2014-statistics/plastic-surgery-statsitics-full-report.pdf. Accessed: Jul 31, 2015. Rebowe RE, Runyan C. Blepharoplasty. StatPearls. 2018 Jan. [Medline]. [Full Text]. Adamson PA, Dahiya R, Litner J. Midface effects of the deep-plane vs the superficial musculoaponeurotic system plication face-lift. Arch Facial Plast Surg. Jan-Feb 2007. 9:9-11. [Medline]. Stenekes MW, Van Der Lei B. Nasolabial fold augmentation with SMAS graft. J Plast Reconstr Aesthet Surg. 2012 Dec. 65(12):1618-21. [Medline]. Auersvald A, Auersvald LA. Hemostatic Net in Rhytidoplasty: An Efficient and Safe Method for Preventing Hematoma in 405 Consecutive Patients. Aesthetic Plast Surg. 2013 Aug 16. [Medline]. Rosenfield LK. The Pinch Rhytidectomy: A Safe, Effective, "Low SMAS" Variation on the Theme. Aesthet Surg J. 2014 Jun 12. 34 (6):825-840. [Medline]. Aston SJ. Platysma-SMAS cervicofacial rhytidoplasty. Clin Plast Surg. 1983 Jul. 10(3):507-20. [Medline]. Becker FF, Bassichis BA. Deep-plane face-lift vs superficial musculoaponeurotic system plication face-lift: a comparative study. Arch Facial Plast Surg. 2004 Jan-Feb. 6(1):8-13. [Medline]. Brennan HG, Koch RJ. Management of aging neck. Facial Plast Surg. 1996 Jul. 12(3):241-55. [Medline]. Calderon W, Andrades PR, Israel G. SMAS graft of the nasolabial area during deep plane rhytidectomy. Plast Reconstr Surg. 2004 Aug. 114(2):559-64; discussion 565-6. [Medline]. DeCastro CC. The role of the superficial muculoaponeurotic system and facelift. Ann Plast Surg. 1986. 16:279-286. Guerrero-Santos J, Espaillat L, Morales F. Muscular lift in cervical rhytidoplasty. Plast Reconstr Surg. 1974 Aug. 54(2):127-30. [Medline]. Honig JF. Facelift approach with a hybrid SMAS rotation advancement flap in parotidectomy for prevention of scars and contour deficiency affecting the neck and sweat secretion of the cheek. J Craniofac Surg. 2004 Sep. 15(5):797-803. [Medline]. Mowlavi A, Wilhelmi BJ. The extended SMAS facelift: identifying the lateral zygomaticus major muscle border using bony anatomic landmarks. Ann Plast Surg. 2004 Apr. 52(4):353-7. [Medline]. Paranque AR, Levan P. [Cervicojugal lifting with the SMAS flap]. Rev Stomatol Chir Maxillofac. 2005 Feb. 106(1):33-7. [Medline]. Waterhouse N, Vesely M, Bulstrode NW. Modified lateral SMASectomy. Plast Reconstr Surg. March 2007. 119:1021-6;. [Medline]. Intraoperative photograph of biplanar face lift with skin flap and extended SMAS flap elevated. The authors and editors of eMedicine gratefully acknowledge the contributions of previous author James D Williams, MD, FACS, to the development and writing of this article.